The intervertebral disc is made up of two components: the annulus fibrosus and thenucleus pulposus. The annulus fibrosus is the outer portion of the disc. It is composed of layers of collagen and proteins, called lamellae. 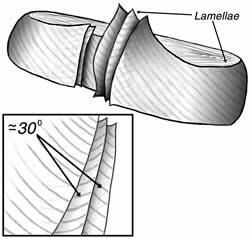 The fibers of the lamellae slant at 30-degree angles, and the fibers of each lamella run in a direction opposite the adjacent layers. This creates a structure that is exceptionally strong, yet extremely flexible. 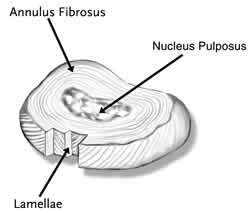 The nucleus pulposus is the inner gel material surrounded by the annulus fibrosus. It makes up about 40 percent of the disc. This ball-like gel is contained within the lamellae. The nucleus is composed primarily of loose collagen fibers, water, and proteins. The water content of the nucleus is about 90 percent at birth and decreases to about 70 percent by the fifth decade. Injury or aging of the annulus fibrosus may allow the nucleus pulposus to be squeezed through the annulus fibers either partially, causing the disc to bulge, or completely, allowing the disc material to escape the disc. 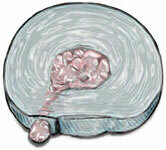 The bulging disc or nucleus material may compress the nerves or spinal cord, causing pain. In the early years of life, the discs have a blood supply that nourishes them. In the second and third decades, discs gradually lose this blood supply, until they are avascular. At this point, the disc begins to degenerate, or age. 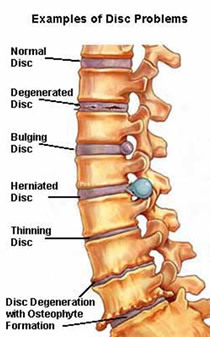 By the age of 50, over 95 percent of all people will have disc degeneration. The disc begins to lose water content and shrinks. The spine’s range of motion and shock-absorbing ability are decreased. This may result in injury to the nerves and vertebrae, and the aging disc itself may generate pain.